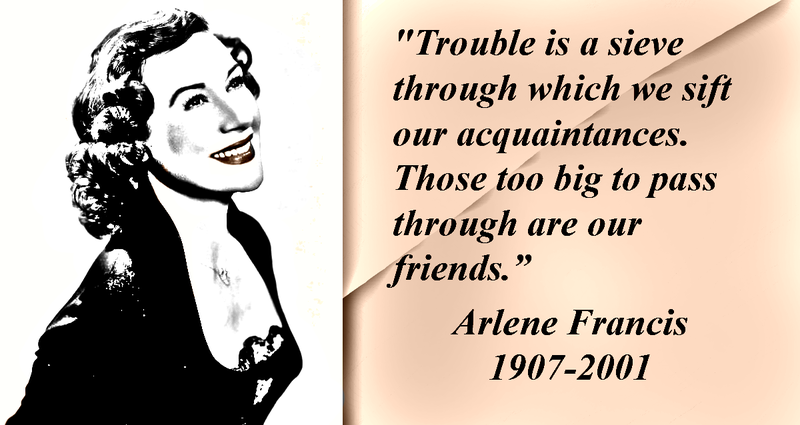 Arlene Francis-The first lady of television and charm. In a recent article I noted Dorothy Kilgallen asked “Why can’t I be the adorable one?”; the adorable one in the situation was Arlene Francis, her co-panelist on the game show ‘What’s My Line?’. It wasn’t a competition or an intentional attempt by Francis to be the charming and personable one; that was how she was. Hosted ‘Blind Date’ from 1949-1952 on ABC and then NBC, after being the radio host of the same show since 1943. A panelist on ‘What’s My Line?’ from 1950 until 1975 on CBS. The editor-in-chief and host of ‘Home’ from 1954-57, a one hour morning show that was a show for NBC viewers to compliment the ‘Today’ and ‘Tonight’ shows. She also stepped in for ‘Today’ show hosts as well as guest hosted the Tonight Show. In 1954 she hosted the reality show ‘The Comeback Story’ on ABC. If you read that closely, you see she was on all three networks at the same time. And all of those were sidelines. She was also a Broadway star, movie actress, radio host, and author. During the 1950s, Newsweek put her on the cover as the “first lady of television”. You need to remember something very important about this time; Lucille Ball was a big hit with ‘I Love Lucy’. 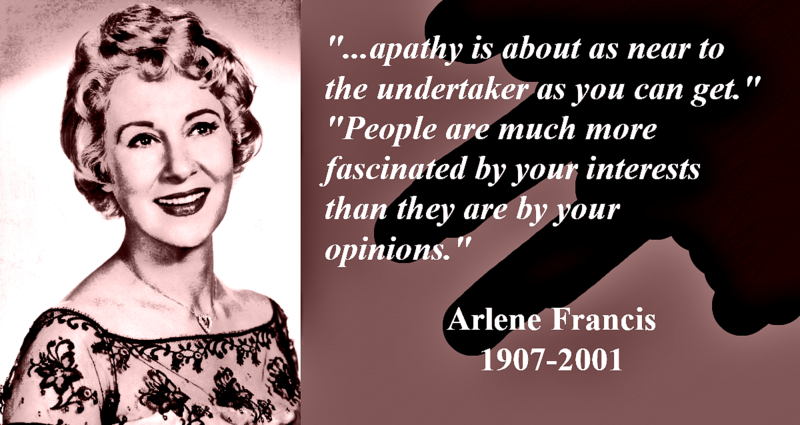 People naturally loved Arlene. She didn’t try or take herself too seriously to the point of not being able to have fun in front of the camera as herself. Then there was that strength you knew would come out when it needed to. Her radio career predated television, and her The Arlene Francis Show ran from 1960 to 1984 where she interviewed people from her first guest in Rock Hudson through others such as Frank Sinatra. Her husband wasn’t the tall, dark and handsome type, although a great Broadway actor. No, he was short, balding, slightly overweight, wore glasses, and an average sort looks wise, but highly intelligent. That was another part of her charm; she went for the real and what she liked, not image. She and Martin Gabel stayed married from 1946 until his death in 1986. You don’t stay the love of the public for so long without charm. Dorothy Kilgallen was smart, tough, and personable enough, but you could see her trying hard to be something a bit more; she wanted acceptance in a way she wasn’t. On ‘What’s My Line?’, you would see Dorothy and Arlene alternate sitting next to Bennet Cerf, the founder and publisher of Random House. Dorothy would wear on Bennet’s nerves, and you can see him ignore her suggestions. Everyone wanted to sit next to Arlene. She was fun, and not intrusive. I think Dorothy was never comfortable in her own skin, while Arlene was comfortable anywhere. For a woman known for knowing so much, her life came to an end in 2001 from cancer and Alzheimer’s. Ronovan Hester is an author, with a debut historical adventure novel Amber Wake: Gabriel Falling due out in February 14, 2016. He shares his life as an amnesiac and Chronic Pain sufferer through his blog RonovanWrites.WordPress.com. His love of writing, authors and community through his online world has led to a growing Weekly Haiku Challenge, Weekly Fiction Prompt Challenge, and the creation of a site dedicated to book reviews, interviews and author resources known as LitWorldInterviews.com.